Alberto here. Every week my purrsonal assistant brings me the best of feline stories on the internet and I select my five favorites. This week is all about creative ways humans are working with shelters to help felines find furever homes and make the time the cats do spend in the shelter much better. Does your shelter do anything newsworthy for felines? I’d love to hear about it! If your shelter hasn’t found creative ways to help shelter cats, purrrhaps you should suggest a working cat program. Two paws up to the Winniepeg Humane Society for their new program that focus’ on felines mental well-being. Shelter cats get bored and even depressed or stressed. These shelter employees and volunteers are being trained to broaden the range of activities for the felines in their care. After working hard to enrich the environment and life of their shelter cats, the shelter director has noticed that the cats are now more engaged with visitors, sitting in the front of their cages and looking to be touched by visitors. Improving the mental health of the cats improves their physical well being. Watch the video and see how happy these shelter cats are with the new program. This idea is excellent for the cats in your home too. Are you at work all day? What does your kitty have to play with while you’re gone? Are there window sills to sit in, places to climb and toys to distract? We felines only have two speeds, fast or stop so when we’re not “stopping” (aka sleeping) we want to have some fun. Be sure and watch the video with the article and purrhaps Sam’s story will inspire some of you human parents out there to teach your kids about fostering. 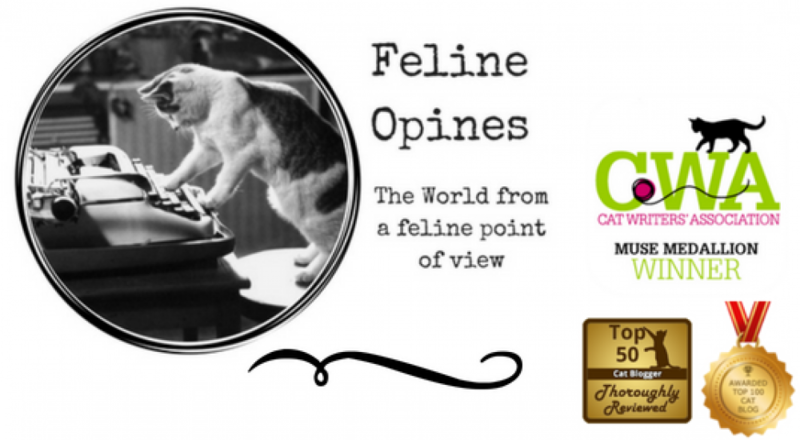 My readers know I love a good cat cafe story and this is one of the best! Since the Christmas season can be a stressful time of year, the Bartow County Library System in Georgia is offering a way to relax and unwind while helping the shelter find furever homes for their felines. The Cartersville Public Library partnered with the Etowah Valley Humane Society to host its first Pages & Paws Cat Cafe. The cafe took place from 1pm-5pm and was a great success (and coffee was donated by a local company). Now that is innovative thinking and I’ve always said there is a littter-ary side to every feline! Does your local library and shelter partner for occasional cat cafe’s? And this was why she co-founded Seniors 4 Seniors Cats on Wheels with fellow volunteer Brooke Smith. The organization offers prospective pet adopters rides to the center to and assisting them in finding a cat to adopt. She also works to debunk the myths about older cats, especially the idea that they won’t be around long. Cats can live up to 20 years. Another belief is that health care costs of an older pet are prohibitive. All shelter cats receive thorough health exams from veterinarians. Two paws up for the Seniors 4 Cats on Wheels program and the creative humans who go above and beyond to help these older kitties find furever homes! What creative things does your shelter do to help felines? I’d love to hear about them and feature them in my Wednesday wanderings.